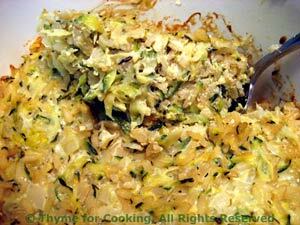 Zucchini Brown Rice Gratin, Thyme for Cooking easy side dish recipe. The brown rice and zucchini are combined with just a bit of yogurt and cheese to create a creamy gratin. Try to find a quick-cooking brown rice or adjust the time accordingly. I use 'Uncle Ben's' which is all I can get. It looks like brown Basmati and cooks in 15 minutes. You could substitute regular Basmati if you prefer. Put 1 cup stock (or whatever your rice requires) and rice into a small saucepan. Cover and bring to a boil. Reduce heat and simmer until done. Shred zucchini using large holes on grater. Add onion, sauté until tender. Add zucchini and sauté until zucchini is tender, slightly translucent and dry. In large bowl whisk egg. Add cheese, yogurt and thyme. Add 1/2 of the zucchini/onion to the eggs and stir well. Add the remaining zucchini along with the rice and 2 tbs chicken stock. Stir well to mix and pour into a baking dish that has been coated with a bit of oil. Bake in 350F (175C) oven for 30 minutes.